A leaked confidential document obtained by Tmo News via T-Mobile’s OneVoice intranet reveals a claim by Cole Broadman, T-Mobile’s Chief Marketing Officer, that their carrier won’t be getting an iPhone 5 in 2011 after all. The legitimacy of this document is however unknown, according to BGR. Though there are still speculations that the carrier might get an iPhone 4S variant instead of the re-designed iPhone 5. A little bit of disappointing news this morning as we just received the above image which shows in no uncertain terms the words of T-Mobile Chief Marketing Officer Cole Brodman. 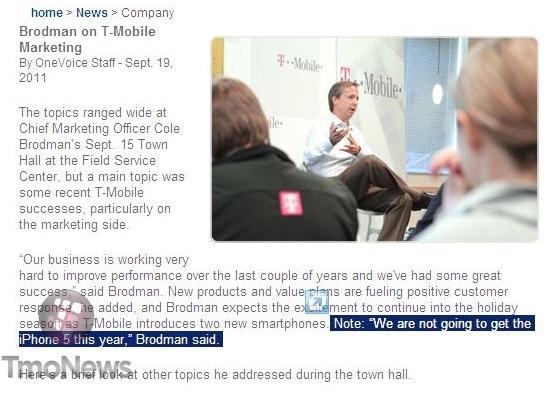 Speaking at a town hall meeting for T-Mobile employees Brodman seemed to confirm that T-Mobile will not carry the iPhone 5 this year. There have been previous reports suggesting iPhone 4 is being tested on T-Mobile’s 3G AWS network and also that an AWS-compatible iPhone 5 is coming to T-Mobile as early as October 2011. The above report however does extinguish majority of these rumors. Nonethless, an AWS iPhone model would be more than welcome in Canada as we have some of the best voice/data plans available.